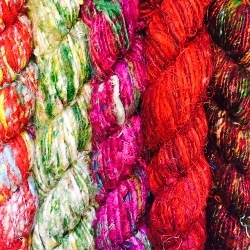 Handspun in India from silk and banana fibres, in lustrous shades. Every skein is different hence they are "unique" and we regret that colours cannot be specified but are sent randomly from our current selection. Can be used for knitting, weaving, creative embroidery, mixed media and other textile art. For knitting the tension is approx 18st and 20 rows to 10cms on 4.5mm needles. Hand wash, pull into shape, dry flat if possible.